Current page: What is a Barrique? The term barrique indicates a small barrel or cask used for fermenting and ageing particular wines and for enhancing distillates such as Grappa. There are various types and sizes. 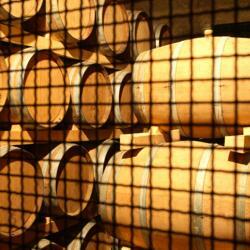 The most used are the 225-litre Bordeaux barrique and the Burgundy barrique which holds 228 litres. They are made with seasoned and toasted oak staves. Naturally the types of oak vary according their provenance and porosity: the more solid and better quality types are suitable for long ageing. The wood used to make the barrel is split into strips, or staves - and not cut, to avoid the soft parts of the fibre - which are left to season in the bad weather for a period varying from 2 to 5 years. The rain beating on the staves being seasoned helps wash out the unwanted tannins from the wood, while the sun's rays have an effect on its organoleptic properties. The staves are then assembled and held by metal rings, giving the whole the typical oval and chopped-off shape. One cubic metre of quality oak can produce up to 5 or 6 barriques. With other types of less solid oak, even 9 or 10 barrels can be made, if the cooper is very careful not to waste anything. During the barrique assembly stage the staves are toasted on the inside using a naked flame. The toasting causes chemical-physical changes in the wood, which have a marked effect on the organoleptic properties of the wine or distillate kept in the barrique. There are basically three types of wood toasting: light, medium, heavy. Each type of toasting gives the distillate different qualities in terms of taste and fragrance: all these characteristics must be extremely clear to the persons supervising the ageing process. In fact, contrary to those who believe that the use of the barrel is similar to mere sleeping of the distillate, the use of the barrique- and the barrel in general - is an extremely complex procedure. It is necessary to know which distillate is more suitable for ageing, for how long and in what conditions of humidity and temperature. The variables in this process are many, and only great experience can give good results; and the complexity of the ageing process should never be underestimated. The ageing capacity of a new barrique finishes after three passages of new wine inside it. This, however, is not the case for Grappa. In fact, since the distillate has a much higher alcoholic content than wine, it can count on its greater force in extracting noble substances from the wood of the barrel. In this case, the useful life-cycle of a barrique is nearly doubled, compared to its life-cycle if used to age wine.